The Mac had the mouse. The iPod had the clickwheel. And the iPhone had the touchscreen. So what does the Apple Watch have? Something called the "digital crown," a tiny knob replacing the conventional crown on traditional watches, and a "Taptic engine" that helps it communicate. They didn't get the most play in today's big, Bono-packed spectacle, but they're pretty damn interesting. Apple is notoriously good at containing leaks, but the company's silence on this launch was unprecedented. And as a result, the internet lost itself in dream-like reverie: Would it be a bangle-style device with a screen that looped your entire wrist? Would lack a screen entirely, an anonymous sensor wristband that acted in tandem with your iPhone? Would it be a flexible screen that solved major problems with medical tracking? Anything seemed possible, but as is so often the case with Apple, the simplest answer was the right one. The Watch looks a hell of a lot like, erm, a watch. And it acts a hell of a lot like an iPhone or a fitness tracker. But what's really truly different? Its interface. On the face of it, the Apple Watch's industrial design is what, in polite society, you might call plain. It's big, it's got distractingly giant beveled edges (not to be confused with bezels), and its proportions make it look like the second cousin to the iPod Nano. Sure, you'll be able to dress it up with a gold case or a Skagen-inspired band, but there's no escaping that clunky, balloon-y shape. Compared to the Moto 360, it's verging on cartoonish. So on the surface, the Apple Watch doesn't look particularly new or surprising, or even that attractive, depending on your tastes. But it does have something more exciting than looks: An entirely new type of user interface; a collection of input and output mechanisms that will, in theory, become the standard for years to come—the Watches of the future might look different, but the dial-and-taptic system is clearly designed to run through the entire paradigm. Unlike every other smartphone design we've seen so far, the Watch doesn't just rely on a tiny touchscreen. It relies on a physical moving part, a dial called the digital crown that acts a lot like a clickwheel: You turn it to zoom, to scroll, to move through the space of the Watch. To use it like your home button, just push it—it takes you back to the home screen. It's "a versatile tool that answers the fundamental challenge of how to magnify content on a small display," says Apple. It's a charmingly simple solution to a complex interface design problem—namely, that of edges. As smartphone manufacturers have moved towards flatter, thinner screens, they've struggled to solve one of the simples problems: Where do you put the buttons? Jony Ive's team has solved it by hiding the Watch's main moving part in a knob that everyone expects to exist on a watch. It just acts like a clickwheel, instead of a watch pin. Easy. But, as anyone who remembers trying to type on a clickwheel—or hell, trying to type out a show to watch on your AppleTV remote—knows, the clickwheel is a great navigation device but a less great way to actually input any kind of information. So Apple has given us a series of systems to both add information and and extract it. To save us from living in a hell of scrolling through a keyboard, character by character, we get three systems to communicate with the Watch: First, a sapphire glass-encased touchscreen that's familiar to us all. Second, Siri, another familiar feature that can take down notations and messages. And most intriguingly, third, a kind of screen never before seen in Apple products: One lined with tiny electrodes that adds a new kinetic layer of interaction—and can tell not only where your finger is, but how hard it's pressing. Where a touchscreen can read two dimensions, a kinetic screen can read three. It's an exponential difference in terms of the vocabulary with which users can talk to their devices. It will make all the difference. And what about how the Watch communicates information to you? Beyond the screen, of course, we get something called a linear actuator: A common mechanism across all manner of electronics but, in this case, the thing that will deliver haptic feedback to the inside of your wrist. Tim Cook compared it to being tapped on the shoulder—a tiny, soundless alert that an event is occurring. 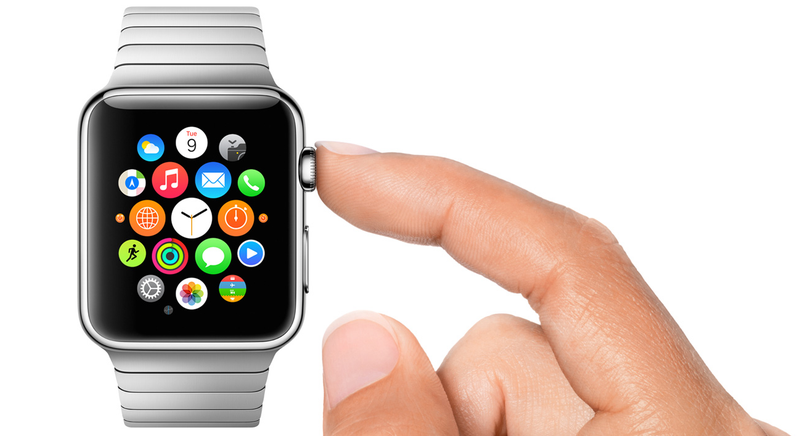 If you chose to look at it, the Watch's accelerometer will notice, blinking on the screen and showing you what's up. If you're walking somewhere, it will buzz when you need to turn. So we know roughly how we're going to talk to this baby—and how it's going to talk to us—but the major unanswered question lies in the software itself. At today's event, we saw a black background covered in bubble-style app icons, which are zoomed in upon through a series of touch-and-dial interactions. This is a big shift away from the method Apple has always organized information in iOSes—it relies not on grid-based logic, but intuition-based touch. Until we actually try it, it's impossible to say how this new graphic standard will actually work. Zooming in on a complex, non-linear series of icons on a tiny screen seems like a potentially frustrating sticking point in an otherwise seamless-looking set of interactions. It's a big, weird risk. But after more than half a decade of Apple playing it safe, it's a risk that's more exciting than annoying.